Oh my goodness friends! 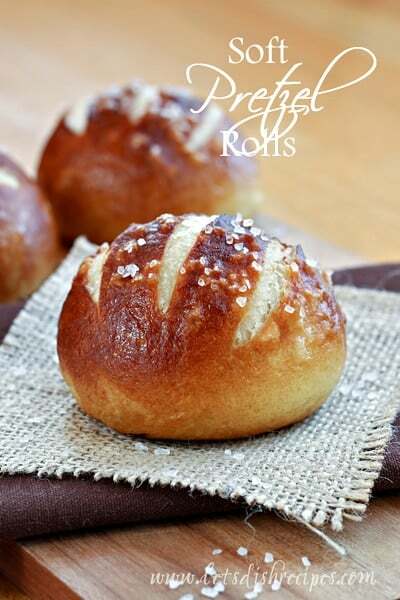 These Soft Pretzel Rolls are amazing and totally worth your time and effort in the kitchen. They have a chewy, golden outer crust and a soft center, just like a soft pretzel. But these are even better, because not only can you eat them hot out of the oven, they make some fantastic sandwiches. Think ham and melty cheese! Like most yeast breads, these rolls aren’t difficult, they just take a little time and patience. To get the chewy, pretzel-like crust, you boil the rolls before baking. Although it’s an extra step, it doesn’t take long and is essential for that true pretzel texture. Also, be sure to add your flour gradually–you’re looking for a dough that is a bit more stiff than regular roll dough, yet still soft. These are truly some of the best rolls I’ve ever made. In the bowl of an electric mixer combine the yeast, oil, milk and water. Stir in the salt. Stir in 4 cups of flour, adding one cup at a time. Gradually add more flour (up to 8 cups) until a soft dough is formed. You may not need to use all the flour. Knead for 4-5 minutes. Transfer dough to a lightly greased bowl. Cover with greased plastic wrap and let rise until doubled in size, about one hour. Divide the dough into 16-18 pieces and shape each piece into a ball. Place the rolls on lightly greased parchment paper. Let rest for 15-20 minutes. Stir 1 tablespoon sugar and 1/4 cup baking soda into a large pot of water. Bring to a boil over medium high heat. Place 3-4 dough balls in the boiling water and boil for 30 seconds to 1 minute on each side (the longer you boil, the chewier the baked pretzel roll will be). Using a slotted spoon, remove the dough from the boiling water and let the excess water drip off into the pan. Place the boiled dough balls onto baking sheets lined with lightly greased parchment paper. Using a very sharp knife, make 2-3 slits in the top of each unbaked roll, about 1/4-inch deep. Lightly sprinkle each dough ball with coarse salt. Bake for 13-17 minutes, or until the rolls are deep golden brown. 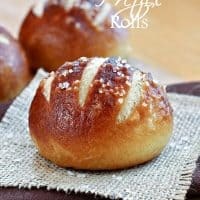 These pretzel rolls look so delicious and fresh! I love the recipe…thanks for sharing! These rolls look so good. Definitely going to try sometime. Can I deep freeze these? After the rising phase, did you punch the dough down to release air or did you pull straight from the bowl to form the dough balls? I didn’t actively punch it down, but it did naturally deflate and release air when I divided it into dough balls. Have you ever made the dough up to the point of baking and freeze them for later? I have never tried that, but I’d love to know how it turns out if you do! I have! They weren’t AS good but still delicious when baked after being defrosted. You let them rise the first time in the bowl after mixing and then form the dough balls. Then you freeze them while on pan and shaped but before their risen just until hard/frozen enough to not stick together… about an hour. After that I just threw them in a freezer ziplock and labeled it with the rest of the baking instructions! (By the time I got around to baking them again it was nice to have on the bag the oven temp, baking and rising time so I didn’t have to go searching for the recipe again!! I’ve made these 4 times now and they’ve been perfect every time! They make great hamburger buns! LOVE this recipe! Thanks so much for sharing. I made these and they didn’t really raise. I I thought my yeast was maybe bad but checked it with sugar and warm water and it rose like it should. These were absolutely amazing!! I will be making these again!!! They were so easy just time consuming like it says. Love them!! First try on this recipe and they came out very nicely! Husband used half of the dough to make braided pretzel buns: basically, just twist two ropes of dough together, boil, bake. These pretzel rolls look beautiful! I tried a pretzel roll recently, and was a little disappointed in the outcome, so I’m searching for others and found yours. I was wondering how much boiling water you need? I’m not sure if there’s a specific ratio of water to baking soda. I was also curious to know why sugar is added to the water, instead of just baking soda. I haven’t seen that before with making pretzels. Just curious! There’s not a specific amount of water you need. As long as it’s enough to put in 3-4 dough balls at a time. I use the same pot I use for spaghetti. But there’s not a specific ratio. And honestly, I don’t know about the sugar. I’m sure they’d turn out fine if you left it out. So, I made these for dinner tonight. This is a lot of dough, so I made more than 16-18 rolls. They were nice and chewy, and my family loved them. HOWEVER, mine do not look like yours. How did you get them so perfect-looking? Yours have a dark sheen (I baked mine for 18-20 minutes… and they were smaller rolls… and mine never got this dark), and yours have a smooth finish and the slashes in the top kept their shape. Mine looks rougher on the surface, and the slashes seem to split open a little. I boiled them for 30 seconds on each side. I’m really trying to seek for perfection on these. Suggestions? Other than that, I honestly don’t have any secrets for making these. But of course I picked the very best looking pretzel roll of the entire batch for my picture. 🙂 And if you look closely, even mine are kind of wrinkly. The first time I made these, they were delicious but turned out rather pale. The next time I made them, I used 8 cups of water, 1 tbsp of dark brown sugar and 1/4 cup baking soda and they turned out nice and dark, just like the pictures on this website. I forgot to mention in my first comment above, I also used an egg wash (1 whole egg beaten with one tablespoon of 10 percent cream). This contributed to the browning as well. How well the dough rises is affected by the temperature of the room. So baking bread in January is harder than in July. I have heard putting it in a warm oven helps, but I’ve totally ruined dough that way because even my lowest setting was too hot. Silly overachieving oven. My dough didn’t reallt rise. I tried doing the warning method that didn’t help. So I tried again, still didn’t rise. I’ve never used a yeast recipe that doesn’t use sugar to rise the yeast… wondering if that was left out of this recipe?